Reuters was nearly 7 minutes ahead of Bloomberg with an announcement from the U.S. Agriculture Department that it planned to donate 200 million lbs of non-fat dry milk surpluses totaling $160 million to help the poor and dairy farmers hit by high feed costs and low prices. Christopher Doering obtained an exclusive copy of the release from a source nearly two hours before USDA made the announcement. The news sparked buying and higher prices in Chicago Mercantile Exchange milk futures as the move helped trim milk and dairy supplies. An over-supply of milk and inadequate demand has led to milk prices plummeting down more than 50 percent from last year, after hitting life-time highs in 2007. SINGAPORE, April 9 (Reuters) - Chicago soybean futures extended gains, rising to a fresh 2-month high, as investors took positions ahead of a crucial U.S. report expected to show a drawdown in soy stocks. "The soybean market is very strong, people are covering their positions before tonight's USDA supply and demand report," said Kaname Gokon, a manager at broker Okato Shoji Co. in Tokyo. KUALA LUMPUR, April 9 (Reuters) - Malaysian crude palm oil futures gained 2.9 percent to hit a new 6-month high, as investors bet on a sharp drop in stocks amid strength in crude and soyoil markets, traders said. "The market seems to be buying on rumour of lower stocks and will sell on fact when the Malaysian palm oil board data comes out," said a trader with a local commodities brokerage. BUENOS AIRES, April 8 (Reuters) - Argentine soyoil and meal shipments fell sharply in January from the same month a year ago while exports of uncrushed beans rose, the Agriculture Secretariat said in its latest monthly report. Argentina is the world's top exporter of soyoil and soymeal as well as the No. 3 supplier of soybeans, and overall exports of the oilseed accounted for roughly a quarter of the country's total export earnings last year. WASHINGTON, April 8 (Reuters) - The boom in corn-based ethanol as motor fuel added from 0.5-0.8 percentage points to U.S. food prices when they were climbing at double the usual rate, said the Congressional Budget Office on Wednesday. In a report, CBO said larger use of ethanol drove up feed prices for cattle, hogs and poultry and, in turn, resulted in higher retail prices for food. LONDON, April 9 (Reuters) - Global equities edged higher on Japan's larger-than-expected economic stimulus package but gains were muted as investors searched for further signs of optimism in the financial crisis hitting economies from Australia to Ireland. "It is a bear market rally, not the start of a new bull market. I don't think there is much good news coming. Most of the good news is out already like the Obama plan, the Geithner plan and the Bernanke plan but they will take three to six months to work -- if they work," said Philippe Gijsels, senior equity strategist at Fortis in Brussels. April 9 (Bloomberg) -- Crude oil rose more than $2 a barrel as equities gained, signaling that some investors expect economies to stabilize, bolstering energy demand. Oil climbed 5.8 percent after stocks advanced on better- than-estimated earnings at Wells Fargo & Co. and speculation banks will pass government stress tests. Prices were also higher after a government report showed a smaller increase in U.S. supplies than the industry indicated a day earlier. Crude oil for May delivery rose $2.86 to settle at $52.24 a barrel at 2:52 p.m. on the New York Mercantile Exchange. Prices have increased 17 percent this year. There will be no floor trading in New York tomorrow because of the Good Friday holiday. The Standard & Poor’s 500 Index added 3.3 percent to 852.68. The Dow Jones Industrial Average rose 2.9 percent to 8,067.85. Other commodities also rose. Copper futures for May delivery gained 7.25 cents, or 3.6 percent, to settle at $2.071 a pound on the Comex division of Nymex. The Reuters/Jefferies CRB Index of 19 commodities advanced 4.17 points, or 1.9 percent, to 227.88. U.S. crude-oil supplies increased 1.65 million barrels to 361.1 million last week, the highest since July 1993, the report yesterday from the U.S. Energy Department showed. The industry- funded American Petroleum Institute said April 7 that stockpiles jumped by 6.94 million barrels to the highest since 1990. Global oil demand falls to an annual low during the second quarter as refineries close to perform maintenance after winter in the Northern Hemisphere. “If prices stay where they are, at about $50, or even drop a little, it will be a good thing because we should not forget that the global economy is shrinking,” Algerian Oil Minister Chakib Khelil told the state-run Algerie Presse Service yesterday. The market continues to be oversupplied, and the Organization of Petroleum Exporting Countries will decide at its May 28 meeting whether to cut production, depending on the state of the global economy, he said. Gasoline stockpiles rose 656,000 barrels to 217.4 million in the week ended April 3. Total daily fuel demand averaged over the past four weeks was 18.9 million barrels, down 4.4 percent from a year earlier, the Energy Department said. It was the lowest consumption for a four-week period since October. Gasoline futures for May delivery rose 4.14 cents, or 2.9 percent, to settle at $1.481 a gallon in New York. Stockpiles at Cushing, Oklahoma, where New York-traded West Texas Intermediate crude oil is delivered, fell 878,000 barrels to 29.98 million last week, the lowest since the week ended Dec. 26. Supplies in the week ended Feb. 6 were the highest since at least April 2004, when the Energy Department began keeping records for the location. Cushing supplies are still above their average of 20.5 million barrels over the past five years. The excess in inventories has weighed on the May Nymex oil contract, which trades at a discount to June futures, a situation known as contango. The difference between the two is now at $2.45 a barrel, up from 69 cents a barrel a month ago. Brent crude oil for May settlement rose $2.47, or 4.8 percent, to end the session at $54.06 a barrel on London’s ICE Futures Europe exchange. Brent is trading at a premium of $1.82 a barrel to the West Texas Intermediate contract in New York, swinging from a discount of 43 cents on March 31. “The WTI-Brent differential does appear to us to be justified by the extreme imbalance” in inventories, Paul Horsnell, head of commodities research at Barclays Capital in London, said in a report today. Still, Barclays is “not overly concerned about the absolute size of the crude inventory overhang,” saying cuts by OPEC will siphon off the excess. Crude oil volume in electronic trading on the Nymex was 516,933 contracts as of 3:01 p.m. in New York. Volume totaled 727,517 contracts yesterday, the highest since March 11 and 30 percent higher than the average over the past three months. Open interest was 1.18 million contracts. April 9 (Bloomberg) -- Soybeans rose to the highest price since January after the government said U.S. inventories will drop to a five-year low before this year’s harvest. Supplies on Aug. 31 will fall to 165 million bushels, down from 185 million projected in March and 20 percent less than pre-harvest inventories in 2008, the U.S. Department of Agriculture said today in a report. Demand for U.S. exports improved with the smaller harvest expected in Argentina, which the USDA estimates will produce 39 million metric tons, down from 43 million forecast last month. “The U.S. is picking up the slack from the falling production in Argentina,” said Christopher Narayanan, the managing director of research at Advance Trading Inc. in Bloomington, Illinois. “USDA tightened up the balance sheet and it could tighten further” without any slowdown in exports, Narayanan said. Soybean futures for May delivery rose 1 cent, or 0.1 percent, to $10.07 a bushel on the Chicago Board of Trade, after earlier jumping as much as 2.5 percent to $10.3075, the highest since Jan. 26. The price gained 1.2 percent this week, the fourth increase in five weeks. Global soybean production will total 218.8 million tons, 2 percent less than the 223.3 million forecast a month ago, largely because of lower planted acreage and drought-curbed yields in Argentina, the USDA said. World inventories on Sept. 30 will be 45.8 million tons, less than the 49.95 million forecast in March and down from 53.1 million tons a year earlier, the USDA said. Prices also rose as stock markets rallied around the world, after Wells Fargo & Co. reported better-than-estimated earnings and as speculation American banks will pass government stress tests boosted confidence in the financial system. Crude oil gained the most in a week, boosting investor demand for alternative assets as a hedge against inflation. April 10 (Bloomberg) -- The dollar rose against the euro, heading for the biggest weekly gain in three months, on speculation investors are shifting funds to U.S. securities on signs the world’s biggest economy is improving. The dollar gained versus 15 of the 16 most-traded currencies after a government report showed the U.S. trade deficit narrowed in February to the lowest level in nine years. U.S. bank shares surged yesterday after Wells Fargo & Co., the second-biggest U.S. home lender, reported a record first-quarter profit that beat the most optimistic Wall Street estimates. The dollar climbed to $1.3129 per euro as of 9:06 a.m. in Tokyo from $1.3169 in New York yesterday. It earlier touched $1.3090, the strongest level since March 18. The dollar rose to $1.4640 versus the pound from $1.4680, and advanced to 100.67 yen from 100.42. The yen was at 132.17 per euro from 132.24. The greenback has risen 2.8 percent against the European currency this week, the most since the period ended Jan. 9. Currency movements may be volatile in Asia as the Easter holiday in the region reduces liquidity, Ishikawa said. FKLI April futures contract continue to surge 12.5 points higher to close at 925.5 as compare to previous trading session with total 8531 lots traded in the market. FKLI starts to surge up higher since 1st trading session due to our new Prime Minister announces new line up for the government cabinet. 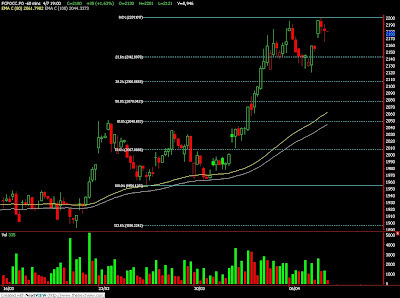 Technically, FKLI seems bottomed around 38.1% Fibonacci retrace support levels at 906 regions in the hourly chart. 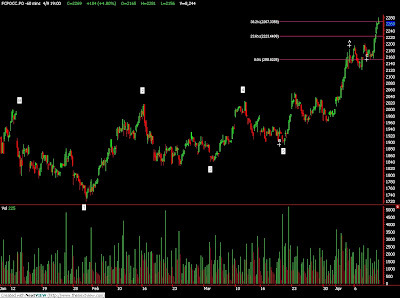 We expect FKLI would ride on a bull rally in the coming trading session provided support levels at 906 and 895 were not violated. Traders were advice to hold long position in the coming trading session while be extra cautious around resistance levels at 940 and 956 regions. FCPO 3rd month June Futures contract surge RM104 higher to close at RM2269 as compare to previous trading session with 8244 lots traded in the market. CPO price was traded higher as crude oil and soybean oil overnight electronic trading was traded firm during the trading session. Technically, CPO price surge fierce during trading session manage to resist around 23.6% Fibonacci projection levels at RM2270 regions. We expect CPO price would trade higher in the coming trading session provided support levels at RM2121 and RM2040 were not violated. Traders were advice to hold long position in the coming trading session while we expect firm selling pressure around resistance levels around RM2300 and RM2340. MUMBAI, April 9 (Reuters) - Indian far-month soybean futures NSBc2 rose to a 9-month high on Thursday tailing overnight gains on Chicago Board of Trade (CBOT) and sharp gains in Malaysian palm, analysts said. Rapeseed futures were also up, tracking gains in soybean and demand from traders and millers, who are now buying heavily in anticipation of a price rise, following mounting concerns of a global squeeze in supplies. At 2:08 p.m., May soybean NSBK9 on the National Commodity and Derivatives Exchange was up 1.95 percent at 2,593 rupees per 100 kg, after hitting a new high at 2,600 rupees, earlier in the day. Rapeseed June futures NRSM9 rose 1.26 percent to 495.05 rupees per 20 kg. The contract had earlier touched a new high at 496 rupees. Malaysian crude palm oil futures rose sharply to hit a new 6-month high on Thursday, as investors bet on a sharp drop in stocks amid strength in crude and soyoil markets, traders said. The benchmark June contract KPOc3 on the Bursa Malaysia Derivatives Exchange rose 4.16 percent to 2,255 ringgit per tonne at 0842 GMT. July soybean futures SN9 on CBOT extended its overnight gains and was up 1.35 percent at $10.15 a bushel during electronic trade on Thursday. The exclusive grain price outlook from the Reuters Food and Agriculture summit got big play among U.S. grains and oil traders. Brokerage houses found it valuable enough to circulate in notes to their clients as soon it hit the wire. Traders quoted the Reuters story in their daily wires distributed before the Chicago Board of Trade markets opened on March 18, fueling more speculation on what USDA was going to say in its March 31 planting intentions report. Trader expectations that the USDA would forecast farmers to plant a couple million less corn acres in 2009 versus a year ago, got the direction right and were near the mark. They also helped keep CBOT new-crop December corn prices supported above $4 a bushel before the report was released on March 31. PARIS/SINGAPORE, April 8 (Reuters) - U.S. grain and soybean futures extended their falls as equities and oil continued to pull back and the dollar to climb amid investor nervousness over the U.S. earnings season getting underway. "We are seeing global equity markets under further pressure," said Garry Booth, a trader at commodity brokers MF Global Australia. SINGAPORE, April 8 (Reuters) - Chinese buyers are seeking June delivery soybeans from South America this week, while Australian exporters are eyeing wheat buyers for the last quarter after selling out until September. Black Sea wheat continued to make inroads into Asia with more sales likely to Indonesia and Vietnam after initial purchases in the past few weeks. JAKARTA, April 8 (Reuters) - Malaysian palm futures were steady by midday, bouncing back from early falls after a bullish Reuters poll on end-March palm stocks offset downward pressure from weaker crude oil prices, traders said. "After Reuters poll came out, the market inched up from negative territory. The poll was a bit bullish because our minister only put 1.5 million tonnes," said a trader at a Kuala Lumpur-based brokerage. KUALA LUMPUR, April 8 (Reuters) - Malaysia's March palm oil stocks are likely to slide 12.8 percent to a 20-month low, slowing slightly as exports remained flat and output notched weak growth after months of decline, a Reuters poll showed on Wednesday. March's inventory level in the world's second-largest producer is seen at 1.36 million tonnes from February, the lowest since July 2007, feeding fears of a squeeze in global vegetable oil supplies, according to a median estimate of five plantation houses. LONDON, April 8 (Reuters) - World stocks slipped for a third session in a row and government bonds and the low-yielding yen gained as poor earnings from U.S. aluminium group Alcoa sparked concerns about other corporates. 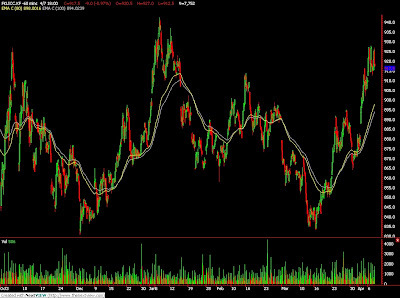 "The market is taking a reflective pause ... Obviously Alcoa was a massive disappointment and was worse than expected," said David Buik, partner at BGC Partners. NEW DELHI, April 8 (Reuters) - India's edible oil imports are expected to rise by a third in March from a year ago because of low prices, further swelling stocks built with heavy purchases in recent months, leading traders and importers said. The average of estimates from 14 leading traders across India showed imports in March were likely to rise to 561,600 tonnes, with figures ranging from 500,000 tonnes to 650,000 tonnes. April 9 (Bloomberg) -- Crude oil rose for a second day, extending yesterday’s gains that followed a U.S. government report showing a smaller inventory gain than industry figures. Supplies increased 1.65 million barrels to 361.1 million last week, the highest since July 1993, the Energy Department said. Stockpiles were forecast to climb by 1.5 million barrels, according to a Bloomberg News survey. The industry- funded American Petroleum Institute said April 7 stockpiles jumped 6.94 million barrels to the highest since 1990. Crude oil for May delivery rose 69 cents, or 1.4 percent, to $50.07 a barrel on the New York Mercantile Exchange at 8:36 a.m. in Sydney. Yesterday, oil climbed 23 cents, or 0.5 percent, to $49.38 after touching $47.37, the lowest since April 1, before the Energy Department report was released at 10:30 a.m. in Washington. Prices are up 11 percent this year. Oil supplies increased last week to 364.7 million barrels, according to API’s April 7 report. API and DOE inventory reports have moved in the same direction 75 percent of the time in the past four years. API collects stockpile information on a voluntary basis from operators of refineries, bulk terminals and pipelines. The Energy Department requires reports to be filed for its survey. The API and DOE showed inventory gains for each of the past four weeks. The total increase over the period was 19.5 million barrels, according to the institute. The government report tallied a gain of 9.73 million barrels. Gasoline stockpiles rose 656,000 barrels to 217.4 million in the week ended April 3, according to the department. Distillate fuels, a category that includes heating oil and diesel, fell 3.35 million barrels to 140.8 million. Gasoline futures for May delivery fell 2.08 cents, or 1.4 percent, to settle at $1.4396 a gallon in New York. Heating oil for May delivery increased 0.79 cent, or 0.6 percent, to end the session at $1.3982 a gallon. Total daily fuel demand averaged over the past four weeks was 18.9 million barrels, down 4.4 percent from a year earlier, the report showed. It was the lowest consumption for a four-week period since October. Global oil demand falls to an annual low during the second quarter as refineries shut to perform maintenance after the Northern Hemisphere winter. Brent crude oil for May settlement increased 37 cents, or 0.7 percent, to end the session at $51.59 a barrel on London’s ICE Futures Europe exchange yesterday. Gold futures for June delivery rose $2.60, or 0.3 percent, to $885.90 an ounce on the New York Mercantile Exchange’s Comex division. Gold set a record of $1,033.90 on March 17, 2008. This year’s high of $1,007.70 was reached on Feb. 20. The most-active contract is little changed this year, advancing 0.2 percent. Silver futures for May delivery gained 13 cents, or 1.1 percent, to $12.34 an ounce. Silver has climbed 9.3 percent this year. U.S. stocks gained, erasing earlier declines, while shares in Asia dropped and equities in Europe rose. Before today, the Standard & Poor’s 500 Index surged 19 percent since March 6, when it touched a 12-year low, while gold dropped 6.3 percent. The S&P 500 jumped as much as 1.6 percent today in New York. Gold also rose, extending yesterday’s 1.2 percent advance, as speculators purchased the metal to cover positions intended to produce gains if the price fell, said Marty McNeill, a trader at R.F. Lafferty Inc. in New York. Before yesterday’s gain, gold dropped 5.9 percent in the previous three sessions. “People didn’t expect gold to run up after the sharp decline, so you have some short covering today,” McNeill said. Gold will surpass last year’s record on speculation that inflation will accelerate, fueled by government programs to bail out failing banks and ease the recession, GFMS said yesterday. Since the second quarter of 2007, banks have reported almost $1.3 trillion in credit losses and writedowns related to the financial crisis. The Treasury Department also began financing-support programs through General Motors Corp. and Chrysler LLC to help auto-parts makers survive the industry’s slump. U.S. sales of new cars and light trucks sank 38 percent in the first quarter. GM will get $2 billion under the programs, which guarantee payments owed to suppliers, a company spokesman said. Chrysler may be able to use $1.5 billion. Platinum and palladium, which are used in pollution-control parts for cars and trucks, also gained. Platinum futures for July delivery climbed $12.40, or 1.1 percent, to $1,187.40 an ounce on the New York Mercantile Exchange. The metal has jumped 26 percent this year. Palladium futures for June delivery rose $9.70, or 4.3 percent, to $235.70 an ounce on Nymex. The metal has surged 25 percent this year. April 8 (Bloomberg) -- Malaysia’s ringgit may weaken as much as 4.5 percent after the opposition coalition, led by Anwar Ibrahim, won two out of three regional elections, according to ING Groep NV, the biggest Dutch financial-services company. The by-elections were seen as a gauge of support for Prime Minister Najib Razak, who took over from his predecessor less than a week ago. Declining foreign-exchange reserves and a likely drop in the Singapore dollar will further pressure the ringgit to weaken, ING said. The ringgit sank 1 percent to 3.6295 against the dollar as of 12:20 p.m. in Kuala Lumpur, according to data compiled by Bloomberg. It has lost 4.2 percent so far this year. The currency may tumble to 3.80, a level at which it was pegged to the dollar until July 2005, before Bank Negara Malaysia steps in to stem losses, Condon wrote. Central banks influence exchange rates by arranging sales or purchases of currencies. A central bank report yesterday showed gold and foreign- exchange reserves fell 3.1 percent in the two weeks ended March 31, the biggest drop this year. The nation’s total foreign- exchange reserves slid to $88 billion on March 31, from as high as $125 billion on June 30. The Monetary Authority of Singapore may devalue the city’s currency and allow it to drop 4 percent against the U.S. dollar by June 30 to lift the economy out of its worst recession since independence in 1965, a Bloomberg survey showed on March 30. “If now is not the time for Singapore to adopt a clearly accommodative monetary policy, then we don’t know when is,” wrote Sean Callow, a Sydney-based currency strategist at Westpac Banking Corp., Australia’s largest lender by market value. Singapore’s dollar may fall to S$1.54 against the greenback “in the days following the review” on April 14, Callow said in the note. Najib was sworn in as Malaysia’s prime minister on April 3, replacing Abdullah Ahmad Badawi, who last year led the coalition to its narrowest election victory since independence in 1957. He has pledged to bring change and end corruption within the United Malays National Organization, the main party in the ruling national alliance. The new premier has unveiled a 60 billion ringgit ($16.5 billion) stimulus package to help the economy weather the global financial crisis. Najib, who is also the finance minister, had said on March 10 that he expects the economy to shrink 1 percent at most this year, the first contraction since 1998. Investors should sell the ringgit against India’s rupee as “the rupee-ringgit cross could go up quite significantly in the second quarter,” wrote Sebastien Barbe, a Hong Kong-based head of emerging-market research and strategy at Calyon, the investment banking unit of France’s Credit Agricole SA. The rupee may rise to as high as 0.077 ringgit in coming months, Barbe said in the note. The rupee-ringgit cross traded at 0.0717, according to data compiled by Bloomberg. MUMBAI, April 8 (Reuters) - Indian soyoil futures rose on Wednesday on firm spot demand triggered by expectations of a supply squeeze, but weakness in rival palm oil in Malaysia and fall in soyoil market on Chicago Board of Trade (CBOT) weighed. At 2:26 p.m., (0856 GMT), the April contract NSOJ9 was up 0.71 percent at 469.85 rupees ($9.3) per 10 kg on the National Commodity and Derivatives Exchange. The May contract NSOK9 edged up 0.19 percent to 469.9 rupees. The global supply may fall on expectations of weak soybean supplies and lower palm oil stocks in major producing countries, analysts said. Soy crop in Argentina, the world's third largest soybean exporter, is seen below previous estimates, while stocks of Malaysian palm oil, a soyoil substitute, may fall by 12.8 percent to a 20-month low, a Reuters poll showed on Wednesday. See[ID:nKLR433268]. Palm oil futures in Bursa Malaysia Derivatives Exchange were slightly down tracking weak crude oil prices, but expectations of lower palm oil stocks in Malaysia at the end of March limited the losses. At 0900 GMT, the benchmark June palm oil contract KPOc3 on the Bursa Malaysia Derivatives Exchange was down 0.55 percent at 2,168 ringgit a tonne. FKLI April futures contract continue to fall 4.5 points lower to close at 913 as compare to previous trading session with total 8261 lots traded in the market. Quiet trading session for FKLI trading despite Dow Jones plunge during overnight trading while regional indices were traded weak. Technically, FKLI was mainly traded sideways during entire trading session within 915 and 908 regions. We expect FKLI would trade lower in the coming trading session provided resistance levels at 916 and 922 were not violated. Traders were advice to hold short position around the resistance levels while be extra alert on support levels at 903 and 895 regions. FCPO 3rd month June Futures contract fall RM15 lower to close at RM2165 as compare to previous trading session with 7502 lots traded in the market. CPO price was mainly traded sideways for entire trading session despite crude oil and soybean oil electronic trading plunge during trading session. 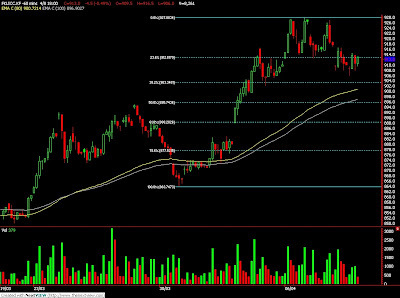 Technically, CPO price seems forms a Bear Harami in the daily chart. It’s a candlestick bear reversal signal where only confirm complete after support levels at RM2121 and RM2153 were violated. We expect CPO price would lower provided support levels were violated. Traders were advice to hold short position once support levels were breach while place tight stop loss around resistances levels at RM2200 and RM2200 regions. MUMBAI, April 8 (Reuters) - Indian soybean futures and soyoil futures rose early on Wednesday as concerns of a squeeze in global edible oil supplies mounted after a poll showed Malaysian palm oil stocks may fall to a 20-month low, analysts said. Palm oil is an edible oil used as a substitute to soyoil. Expectations of firm demand for oilseeds and soyoil in the spot market also impacted the prices, analysts said. At 10:37 a.m, May soybean NSBK9 on the National Commodity and Derivatives Exchange was up 0.61 percent at 2,544 rupees per 100 kg, after making a new high of 2,555.5 rupees earlier. May soyoil NSOK9 was at 470.5 rupees per 10 kg, up 0.36 percent, while the most active June rapeseed futures NRSM9 were up 1.6 percent at 492.3 rupees per 20 kg after hitting a new high at 495 rupees. April 7 (Bloomberg) -- Members of the Organization of Petroleum Exporting Countries have split with developing nations over more stringent cuts in the burning of fossil fuels, fearing their economies will suffer from shrinking demand for oil. Most developing countries are calling for wealthier nations to reduce carbon-dioxide emissions 40 percent to 45 percent by 2020 at climate talks in Bonn, Chinese negotiator Su Wei said. Oil producers are concerned the cuts will shrink energy exports. The world’s nations are negotiating a UN climate-change treaty to cut fossil-fuel emissions and slow global warming by improving the energy efficiency of vehicles and buildings, installing solar panels and adding wind farms. United Nations scientists say developed countries need emissions cuts of 25 percent to 40 percent by 2020 to avert the worst effects of climate change. Now developing countries want more. “Developed country parties should undertake deeper cuts of the order of at least 40 percent,” China’s Su said in an interview in Bonn, citing their “historical” responsibility. That view is shared by a “majority” of the G77 and China, a group of about 130 developing nations, he said. Developed countries including the U.S. are among the nations that haven’t yet agreed to reducing emissions 20 percent by 2020 from 1990 levels. Based on what they have proposed so far, those countries will probably cut carbon output 4 percent to 14 percent, the environmental group Greenpeace estimates. The G77 is trying to juggle the interests of members ranging from low-lying island states that stand to lose the most from rising sea levels amid global warming and oil-producing nations such as Saudi Arabia that will suffer should demand for fossil fuels decline. Some oil producers have yet to agree on the call for more demanding emissions cuts from industrialized nations, Pa Ousman Jarju, a Gambian delegate who speaks on behalf of a group of 49 least-developed countries, said in an interview. OPEC countries are negotiating in part of the group that Gambia belongs to. Crude oil has fallen 65 percent from a record in July and traded near $51 a barrel today. Qatari Oil Minister Abdullah bin Hamad al-Attiyah said yesterday he doesn’t expect prices to rebound to $70 a barrel this year as the 12-member OPEC implements its biggest-ever supply reduction. Saudi Arabia, the largest oil producer in the world, will suffer as the U.S. and Europe strive for energy security, or reduced imports of fossil fuels, while presenting their efforts as climate-change mitigation, Al Sabban said. April 8 (Bloomberg) -- Crude oil fell for a fourth day on speculation that a government report today will show U.S. supplies increased as the recession curbed fuel demand. Stockpiles rose 1.5 million barrels last week, according to the median of 12 estimates by analysts in a Bloomberg News survey before the Energy Department report. Futures also dropped as falling U.S. equities signaled that fuel demand in the world’s biggest energy-consuming country will decline. Crude oil for May delivery fell 83 cents, or 1.7 percent, to $48.32 a barrel at 8:18 a.m. Sydney time on the New York Mercantile Exchange. Oil has risen 8.3 percent this year and is down 67 percent from a record in July. Yesterday, crude dropped $1.90, or 3.7 percent, to $49.15 a barrel, the lowest settlement since April 1. The drop in prices accelerated in electronic trading after the industry-funded American Petroleum Institute reported that oil supplies increased last week to the highest since 1990. Stockpiles rose 6.94 million barrels to 364.7 million, API said. The report was released at 4:30 p.m. in Washington. Crude-oil inventories climbed 2.84 million barrels to 359.4 million in the week ended March 27, the highest since July 1993, the Energy Department reported on April 1. It was the 23rd gain in 27 weeks. The increase left supplies 13 percent higher than the five-year average. The price of oil for delivery in May is lower than for the following months, allowing buyers to profit from storing crude, a structure known as contango. The price of oil on the Nymex for delivery in June is $2.76 a barrel higher than for May, up from a $2.33 premium April 6. Gasoline stockpiles probably dropped 1.4 million barrels from 216.8 million the prior week, according to the survey of analysts. Distillate fuels, a category that includes heating oil and diesel, probably fell 600,000 barrels from 144.2 million. Gasoline futures for May delivery dropped 1.51 cents, or 1 percent, to settle at $1.4604 a gallon in New York. Heating oil for May delivery fell 2.88 cents, or 2 percent, to end the session at $1.3903 a gallon. Refineries probably operated at 81.7 percent of capacity, unchanged from the week before, according to the median of responses in the survey. The International Energy Agency, the Organization of Petroleum Exporting Countries and the Energy Department cut their 2009 forecast for oil demand in March. The IEA will probably lower its global demand outlook this month, given slowing world economic growth, Executive Director Nobuo Tanaka said April 2. The Paris-based agency is scheduled to release its next report on April 10. The Standard & Poor’s 500 Index fell 2.3 percent to 816.03 yesterday. The Dow Jones Industrial Average tumbled 193.06 points, or 2.4 percent, to 7,782.79. Brent crude oil for May settlement dropped $1.02, or 2 percent, to end the session at $51.22 a barrel on London’s ICE Futures Europe exchange. May Brent futures are $2.07 a barrel higher than Nymex oil for the same month, the biggest premium for the front-month contract since Feb. 24. Brent oil is often priced at a discount to Nymex crude and traded lower for most of March. April 7 (Bloomberg) -- Gold rose for the first time in four sessions on speculation that the credit crisis will deepen, boosting the precious metal’s appeal as a haven. Bank stocks headed lower after the Times of London reported that the International Monetary Fund will raise its toxic-debt estimate to $4 trillion. Gold reached $1,007.70 an ounce on Feb. 20, this year’s high, before a monthlong surge in equities curbed demand for the metal. Gold futures for June delivery rose $10.50, or 1.2 percent, to $883.30 an ounce on the Comex division of the New York Mercantile Exchange. Gold still is down 0.1 percent this year, after eight straight annual gains. The IMF will raise its estimates for U.S.-originated bad debt to $3.1 trillion from a January prediction of $2.2 trillion, with estimates of another $900 billion of toxic assets from Europe and Asia, the Times newspaper said today, without describing where it got the information. U.S. stocks fell for a second straight day after investor George Soros said the rally in equities won’t last. Shares in Europe and Asia also declined. Before this week, the Standard & Poor’s 500 Index had gained 23 percent since March 6 while gold declined 4.8 percent. Investment in the SPDR Gold Trust, the biggest exchange- traded fund backed by bullion, has remained unchanged at 1,127.37 metric tons for two straight days. Bullion held in the Trust has gained 44 percent this year. Silver, platinum and palladium, which have wider industrial uses than gold, also gained. Silver futures for May delivery rose 10 cents, or 0.8 percent, to $12.21 an ounce. The metal has gained 8.1 percent this year. Platinum futures for July delivery climbed $22.40, or 1.9 percent, to $1,175 an ounce on the New York Mercantile Exchange. The metal is up 25 percent this year. Palladium futures for June delivery rose 25 cents, or 0.1 percent, to $226 an ounce on the Nymex. The price has advanced 20 percent this year. Price gains may stall for palladium and platinum after buyers take advantage of last year’s price decline to restock supply, Scotia Capital said. Platinum lost 38 percent and palladium declined 50 percent in 2008. Gold gained 5.5 percent last year while silver lost 24 percent. FKLI April futures contract continue to fall 9 points lower to close at 917.5 as compare to previous trading session with total 7752 lots traded in the market. Wild trading day for FKLI trading days but manage to trade lower before market close due Dow Jones electronic trading and 3 by-election that going on process. Technically, FKLI seems topped around 927 regions after tested it for 3 consecutive attempts. 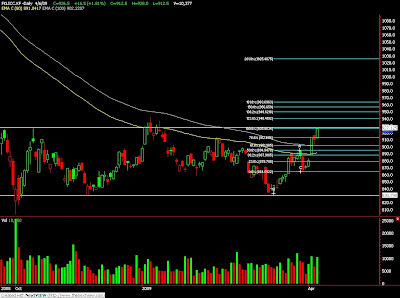 We expect FKLI would retrace in the coming trading session provided resistance levels at 927 and 940 were not violated. Traders were advice to hold short position in the coming trading session while be extra cautious around support levels at 896 and 863 regions. FCPO 3rd month June Futures contract rose RM35 higher to close at RM2180 as compare to previous trading session with 8946 lots traded in the market. Wild trading day for CPO price trading after manage to test high and low of previous trading session as soybean oil and crude oil electronic trading was also traded wild. Technically, CPO price seem tested 150% Fibonacci projection at RM2192 region after false break at RM2201 regions. We expect CPO price seems slightly on the top side despite currently still riding on bull trend. Traders were advice to hold long position if CPO price manage to retrace lower toward support levels at RM2100 and RM2050 region. Resistances were seen at RM2210 and RM2237 regions. MUMBAI, April 6 (Reuters) - Indian soyoil futures rose on Monday afternoon tracking firm spot prices as buyers expected a rise in global demand on signs of an economic recovery and firm soyoil market on Chicago Board of Trade (CBOT). Rise in crude oil prices and a forecast of lower soy output in Argentina, a leading producer, also supported prices. Firm crude oil prices may push up demand for soyoil from the biofuel sector globally, analysts said. At 3:20 p.m., (0950 GMT), the April contract NSOJ9 was up 0.68 percent at 465.50 rupees ($9.3) per 10 kg on the National Commodity and Derivatives Exchange. The May contract NSOK9 rose 0.58 percent to 468.45 rupees. The prices in the spot market in central city of Indore, a hub for soyoil trade in India, rose 0.44 percent to 45,200 rupees per tonne. July soyoil prices BON9 on Chicago Board of Trade (CBOT) rose 0.65 percent to 35.81 cents per pound during electronic trade on Monday. However, weakness in Malaysian palm oil, which fell on profit-taking, weighed on the markets, analysts said. April 7 (Bloomberg) -- Crude oil rose as U.S. and Asian equity futures gained, signaling that some investors expect economies to stabilize, boosting demand for energy. Oil rose as much as 0.7 percent as the Standard & Poor’s 500 June futures and Nikkei 225 June futures advanced. U.S. stocks fell for the first time in five days yesterday, pulling oil prices lower, after Mike Mayo, an analyst at Calyon Securities USA Inc., advised selling bank shares. “The equity markets are climbing back and are up after hours, and the Asian markets are trading quite a bit higher,” said Tom Hartmann, a commodity analyst at AltaVest Worldwide Trading Inc. in Mission Viejo, California. Crude oil for May delivery gained 28 cents, or 0.6 percent, to $51.33 a barrel at 8:18 a.m. Sydney time on the New York Mercantile Exchange. Oil has risen 15 percent this year and is down 65 percent from a record in July. Yesterday, crude dropped $1.46, or 2.8 percent, to settle at $51.05 a barrel. 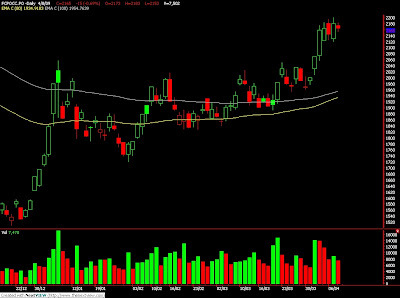 The S&P futures rose 0.3 percent to 832.90, and the Nikkei futures added 0.3 percent to 8,920. The Standard & Poor’s 500 Index declined 0.8 percent yesterday to 835.48. It rose 3.3 percent last week, in its fourth consecutive weekly rally. Mayo, a former Deutsche Bank AG analyst who gained a reputation for independence, said yesterday that government measures to shore up banks may not help as much as expected and loan losses will exceed levels from the Great Depression. Crude-oil inventories in the U.S., the world’s largest energy-consuming nation, rose to 359.4 million barrels in the week ended March 27, a 15-year high. Supplies probably rose 1 million barrels last week, according to a Bloomberg News survey of nine analysts. The International Energy Agency will probably lower its global demand forecast this week, given slowing world growth, Executive Director Nobuo Tanaka said April 2. Qatari Oil Minister Abdullah bin Hamad al-Attiyah said yesterday he doesn’t expect prices to rebound to $70 a barrel this year as OPEC implements its biggest-ever supply reduction. “Fifty dollars a barrel is reasonable for the world economy now,” Qatar’s al-Attiyah said. Crude oil at $50 a barrel is also “enough” for Venezuela, the country’s president, Hugo Chavez, said on state television after floor trading closed yesterday. Qatar is OPEC’s second- smallest oil producer after Ecuador. Venezuela is its sixth largest, after Saudi Arabia, Iran, Iraq, the United Arab Emirates and Kuwait. Brent crude oil for May settlement dropped $1.23, or 2.3 percent, yesterday to $52.24 a barrel on London’s ICE Futures Europe exchange. The Brent contract was $1.19 a barrel more expensive than May crude traded on the Nymex, based on yesterday’s prices. That’s the most since Feb. 17. Brent oil is often priced at a discount to Nymex crude and traded lower for most of March. April 7 (Bloomberg) -- The yen gained from five-month lows against the dollar and euro after U.S. stocks ended a four-day rally, spurring speculation that global stocks will slide and boost demand for safer assets. The Japanese yen rose against both currencies for the first time in almost a week after a Calyon Securities analyst said loan losses at banks will exceed levels from the Great Depression. Australia’s dollar slumped for a third day as traders increased bets that the Reserve Bank of Australia will reduce its key interest rate from the lowest level in 45 years. The yen advanced to 134.30 per euro as of 8:39 a.m. in Tokyo from 135.49 late yesterday in New York. Japan’s currency gained to 100.66 per dollar from 100.99. The greenback traded at $1.3344 against the euro from $1.3416. Australia’s dollar fell for a third day against the U.S. currency, slipping to 70.90 U.S. cents from 71.39 cents yesterday. New Zealand’s dollar declined to 58.04 U.S. cents from 58.83, halting a four-day advance. The Standard & Poor’s 500 Index dropped 0.8 percent after Mike Mayo, a bank analyst at Calyon, assigned an “underweight” rating to U.S. banks including Winston-Salem, North Carolina- based BB&T Corp. and Cincinnati’s Fifth Third Bancorp. Losses on banks’ non-mortgage loans such as credit-card debt will probably accelerate, he wrote in a report yesterday. The Dollar Index, used by the ICE to track the greenback against the currencies of six major U.S. trading partners, increased 0.5 percent to 84.571 yesterday. The gauge dropped 2.9 percent in March. Federal Reserve Governor Kevin Warsh said yesterday the financial turmoil that has prompted one of the worst recessions in the postwar period is showing signs of ending, though growth may remain below normal for some time. Traders are betting the RBA will cut its key borrowing rate by at least 50 basis points, according to a Credit Suisse Group index based on swaps trading. The index yesterday indicated a 38 percent chance of a reduction of that size. The Australian dollar has advanced 12 percent since the RBA left its benchmark rate on hold at 3.25 percent on March 3. New Zealand’s target rate is 3 percent. Bank of Japan Governor Masaaki Shirakawa and his colleagues will keep the target lending rate at 0.1 percent today, according to 25 of 26 economists surveyed by Bloomberg News before the bank’s announcement in Tokyo. The Federal Reserve and four other central banks announced a currency swap arrangement that will give the U.S. central bank access to as much as $285 billion in euros, yen, British pounds and Swiss francs. “Central banks continue to work together and are taking steps as appropriate to foster stability in global financial markets,” the Fed said in a statement yesterday. April 6 (Bloomberg) -- Gold fell to the lowest price in more than two months, erasing this year’s gains, on speculation that the U.S. economy will rebound, eroding the precious metal’s appeal as a haven. Silver dropped the most in two weeks. Investment in the SPDR Gold Trust, the biggest exchange- traded fund backed by bullion, fell for the first time in two weeks as a month-long rally in equities curbed demand for safety assets. Before today, the Standard & Poor’s 500 Index had rallied 23 percent since March 6 while gold dropped 4.8 percent. “People don’t think they need that flight-to-quality buying and that’s putting gold into the background,” said Stephen Platt, a commodity analyst at Archer Financial Services Inc. in Chicago. Gold futures for June delivery fell $24.50, or 2.7 percent, to $872.80 an ounce on the Comex division of the New York Mercantile Exchange. The price earlier reached $865, the lowest for a most-active contract since Jan. 23. Today’s decline left gold down 1.3 percent this year, after posting annual gains every year since 2001. Silver futures for May delivery declined 62.5 cents, or 4.9 percent, to $12.11 an ounce, the biggest percentage drop since March 18. Silver is still up 7.2 percent this year. The Federal Reserve began buying Treasuries maturing between 10 years and 17 years from now to reduce consumer- lending rates and ease the recession. Fed Chairman Ben S. Bernanke said on April 3 that the central bank’s efforts to unfreeze credit are working, including an earlier reduction of the benchmark interest rate to near zero. “People are feeling more comfortable about economic prospects,” Platt said. Stocks in the U.S. and Europe fell while equities in Asia rallied. The amount of bullion held by the SPDR Gold Trust declined 1,107 ounces to 1,127.37 metric tons on April 3. Before the decline, assets were unchanged at a record 1,127.44 tons reached on March 27. The fund is still up 44 percent this year. Gold’s losses accelerated after the price closed below $900 on April 3, analysts said. “Those not out of gold should use any bounce back toward $894 to exit the trade and focus their energies elsewhere,” said Dennis Gartman, an economist and the editor of the Suffolk, Virginia-based Gartman Letter. Lower gold prices may attract buyers from India, some analysts said. Imports by India, the biggest buyer of the precious metal, had been near zero in the past two months, according to the Bombay Bullion Association Ltd.
“Gold, at the new price equation, found buyers in India for a change,” said Jon Nadler, analyst at Kitco Inc. in Montreal. FKLI April futures contract continue to surge16.5 points higher to close at 926.5 as compare to previous trading session with total 10377 lots traded in the market. FKLI was traded wild during the trading session due some profit taking activities in the morning trading session but manage to surge later as regional indices manage continue to surge up in the second trading session. 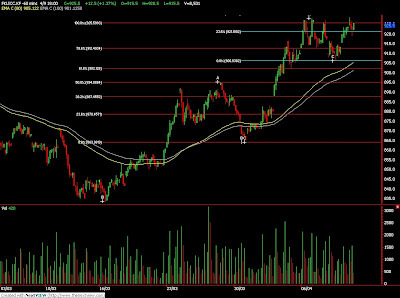 Technically, FKLI manage to test previous high levels at 927 region which also almost same with 100% Fibonacci projection levels at 925 region. We expect FKLI would trade higher in the coming trading session provided resistant levels at 927 and 942.5 were violated. 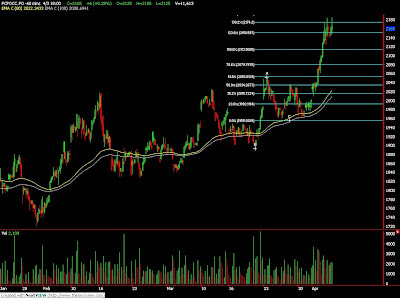 However, traders were advice to hold long position around the support levels at 900 and 887 regions FKLI seems slightly overbought during trading session. FCPO 3rd month June Futures contract close marginally RM20 lower at RM2145 as compare to previous trading session with 7783 lots traded in the market. CPO price was mainly traded lower during the trading session despite crude oil and soybean oil electronic trading shows firm buying interest in the market. Technically, CPO traded lower during the trading session after being resisted around 150% and 161.8% Fibonacci projection levels at RM2193 and RM2212 regions. 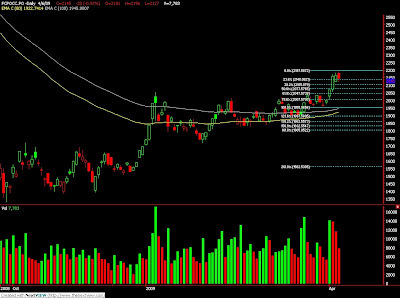 We expect CPO price would trade lower in the coming trading for some correction after surge up for 4 consecutive days. Traders were advice to hold long position around support levels at RM2100 and RM2050 regions provided resistance levels were not violated. JAKARTA, April 6 (Reuters) - Indonesia may lower the threshold price for taxing crude palm oil exports from $700 per tonne in order to discourage exports of the commodity and ensure adequate domestic supplies, an official said on Monday. "There is a possibility that we may impose tax even if the reference price is lower than $700" per tonne, said Bayu Krisnamurthi, a deputy to the chief economic minister. MUMBAI, April 6 (Reuters) - India soybean, rapeseed and soyoil futures may rise on Monday morning tracking gains in rival Malaysian palm oil and U.S. soyoil and soybean markets, analysts said. A firm crude oil is likely to support prices as it may push up the demand for soyoil and oilseeds from the bio fuel sector. Soybean and rapeseed are oilseeds, which is crushed to produce edible oils. May soybean NSBK9 on the National Commodity and Derivatives Exchange ended at 2,488.5 rupees per 100 kg, up 1.8 percent on Saturday, while May soyoil NSOK9 ended at 465.75 rupees per 10 kg, up 1.06 percent. At 09:23 a.m., the benchmark June palm oil contract KPOc3 on the Bursa Malaysia Derivatives Exchange was up 0.55 percent at 2,177 ringgit a tonne, after hitting a new high at 2,196 ringgit. April 6 (Bloomberg) -- The yen declined to a five-month low against the dollar and the euro as last week’s worldwide equities rally added to speculation that the worst of the global financial crisis may be over soon. The yen also fell to weakest since November against New Zealand’s dollar and dropped against Australia’s currency after Federal Reserve Chairman Ben S. Bernanke said last week programs to unfreeze credit markets are working, damping demand for the Japanese currency as a refuge. “Expectations are emerging that a global recession and financial crisis may be coming closer to a turning point,” said Akio Yoshino, chief economist in Tokyo at Societe Generale (Japan) Co., a unit of the French asset management firm that supervises the equivalent of $338 billion. The yen traded at 136.04 per euro, the lowest since Oct. 21, at 8:24 a.m. in Tokyo, from 135.26 late on April 3 in New York. Japan’s currency touched 100.59 against the U.S. dollar, the weakest since Oct. 21. New Zealand’s dollar advanced to 59.56 yen, the highest since Nov. 10, from 58.76. North Korea’s rocket launch over the Sea of Japan during the weekend didn’t affect demand for the yen, according to Osamu Takashima, chief analyst at Bank of Tokyo Mitsubishi UFJ Ltd., a unit of Japan’s largest bank. The rocket flew over Japan on a trajectory into the Pacific Ocean yesterday, according to a statement from the Japanese Prime Minister’s Office. U.S. President Barack Obama said yesterday the firing of the Taepodong 2 missile was “provocative” and a “clear violation” of a United Nations Security Council resolution. FKLI April futures contract retrace 3 points lower to close at 910 as compare to previous trading session with total 6611 lots traded in the market. FKLI was mainly traded sideways during a trading session as regional indices and Dow Jones futures electronic trading shows some profit taking activities. 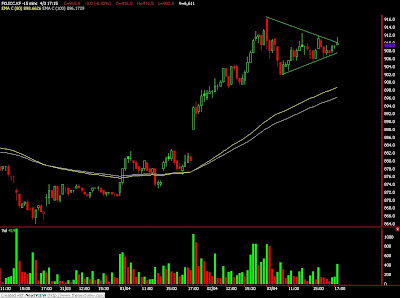 Technically, FKLI seems consolidate and forms a symmetric triangle in the 15 min chart after bull rally took on the previous trading session. We expect FKLI would trade higher in the coming trading session provided FKLI price manage to hold above resistance level at 914 and 920 regions. Traders were advice to hold long position in the coming trading session provided support levels at 894 and 865 were not violated. FCPO 3rd month June Futures contract close marginally RM6 higher at RM2159 as compare to previous trading session with 11613 lots traded in the market. CPO price was traded wild during trading session due do some profit taking activities despite crude oil electronic trading was traded high during trading session. Technically, CPO seems encounter some great selling pressure around resistance levels around RM2180 regions despite of 3 attempt try to breach the resistance levels. We expect CPO still riding on a bull rally provided that support levels at RM1955 and RM2050 regions must not be violated. Traders were advice to hold long position in the coming trading session around support levels while be alert around resistance levels at RM2180 and RM2292 regions. April 3 (Bloomberg) -- Crude oil dropped after a report showed the U.S. jobless rate at a 25-year high, adding to concern fuel demand will slide further. Oil fell as much as 3.1 percent after the Labor Department said the economy lost more than 650,000 jobs for a fourth consecutive month. Total daily fuel demand averaged over the past four weeks reached the lowest since October, the Energy Department said April 1. “If the turnaround in the economy isn’t going to happen as soon as people had hoped, then oil remains under pressure, and we’ll start testing the lows from the beginning of the year, back below $35,” said Addison Armstrong, director of market research at Tradition Energy in Stamford, Connecticut. Crude oil for May delivery fell 13 cents, or 0.3 percent, to settle at $52.51 a barrel at 2:49 p.m. on the New York Mercantile Exchange. Oil has risen 13 cents this week, for a seventh consecutive gain. That’s the longest stretch of increases since July 2007. Prices are up 18 percent this year. Crude rose 8.8 percent yesterday, driven by the Group of 20 plan to foster global economic recovery. It touched $32.70 in intraday trading on Jan. 20. Unemployment jumped to 8.5 percent from 8.1 percent in February, the Labor Department said today. Employers cut 663,000 workers, bringing total losses since the recession began to 5 million, the biggest slump since World War II. Service industries in the U.S. unexpectedly contracted in March at a faster pace as unemployment climbed and consumer confidence held near a record low, according to the Institute for Supply Management’s index of non-manufacturing businesses. Total daily fuel demand was 18.9 million barrels in the four weeks ended March 27, down 4.4 percent from a year earlier, according to the Energy Department. The International Energy Agency is likely to trim its demand forecast in its next monthly report on April 10 because of declining global economic growth projections, Executive Director Nobuo Tanaka said yesterday in an interview with Bloomberg Television. Gasoline futures for May delivery rose 2.26 cents, or 1.5 percent, to settle at $1.4924 a gallon in New York on speculation that demand will rise as the summer driving season approaches. The season extends from the U.S. Memorial Day holiday in late May until Labor Day in early September. Gasoline stockpiles were 3.5 percent below year-ago levels in the week ended March 27, according to the Energy Department. Lower demand by refiners is prompting some sellers to reduce prices. Saudi Arabia may lower prices for crude oil sold to Asia for the first time in four months as processing profits declined, refinery officials said. Saudi Arabian Oil Co., the world’s largest oil producer, may cut its Arab Heavy and Arab Medium oil grades, according to a survey of refiners in Taiwan, Singapore, Japan and China. Saudi Aramco, as the company is also known, is expected to provide prices next week. Brent crude oil for May settlement climbed 72 cents, or 1.4 percent, to $53.47 a barrel on London’s ICE Futures Europe exchange. The Brent contract has risen 10 percent in the past two days and is now 96 cents a barrel more expensive than May crude traded on the Nymex, the most since Feb. 24. Brent oil is historically priced at a discount to Nymex crude and traded lower for the four weeks until April 1. The number of oil rigs operating in the U.S. rose for a second week, according to data published by Baker Hughes Inc. today. The count increased by 7, or 3.2 percent, to 224 in the week ended today. The oil rig count reached 215, the lowest since Feb. 17, 2006, in the week ended March 20. It’s down from a peak of 442 on Nov. 7. Oil rose 11 percent in the first quarter after tumbling 56 percent in the previous three months. Crude oil may trade between $47 and $53 a barrel in New York next week as U.S. stockpiles increase and OPEC members reduce production to bolster prices, according to a Bloomberg News survey of analysts. Sixteen of 33 respondents, or 48 percent, said futures will be little changed through April 9. Twelve, or 36 percent, forecast that oil will decline and five analysts said there will be an increase. Last week, 53 percent of analysts expected prices to decline. Crude oil volume in electronic trading on the Nymex was 373,028 contracts as of 2:57 p.m. in New York. Volume totaled 514,788 contracts yesterday, 7.6 percent lower than the average over the past three months. Open interest was 1.16 million contracts. The exchange has a one-business-day delay in reporting open interest and full volume data. April 3 (Bloomberg) -- Soybeans rose to a seven-week high on speculation that demand for U.S. supplies will improve as overseas buyers shift away from crops from Argentina, the second-biggest exporter. U.S. exporters sold 599,842 metric tons of soybeans in the week ended March 26, up 40 percent from a week earlier and 53 percent more than the previous four-week average, the U.S. Department of Agriculture said yesterday. Farmers in Argentina are limiting sales in a yearlong dispute with the government over a 35 percent export tax. “Export sales were favorable last week and should remain active,” said Greg Grow, director of agribusiness at Archer Financial Services Inc. in Chicago. “It’s been a positive week on the technical charts,” with soybeans yesterday reaching seven-week highs, Grow said. Soybean futures for May delivery rose 18.5 cents, or 1.9 percent, to $9.955 a bushel on the Chicago Board of Trade, after earlier touching $9.975, the highest since Feb. 10. The most- active contract gained 8.6 percent for the week, the third weekly gain in four weeks. Argentine farm groups met with government officials on March 31 but failed to resolve the dispute over export taxes. They are now trying to get enough support among lawmakers to have the issue debated in Congress. The Congress on March 26 approved a proposal backed by President Cristina Fernandez de Kirchner to move up this year’s mid-term elections, possibly delaying any tax changes until later this year. The Argentina soybean crop may be smaller that expected after unusually warm, dry weather the last 30 days, said Brian Grete, senior market analyst for the Professional Farmers of America newsletter in Cedar Falls, Iowa. The harvest may be less than 40 million metric tons, down from 43 million estimated last month by the U.S. Department of Agriculture and below last year’s production of 46.2 million tons. “The rains in late February and early March provided only temporary relief and crops appear to have declined since then,” Grete said. “Smaller crops and continued political tensions may keep overseas buyers wary,” shifting purchases to U.S. supplies, Grete said. Soybeans are the second-biggest U.S. crop, valued last year at $27.4 billion, government figures show. Corn was the most valuable crop at $47.4 billion. The U.S. is the world’s largest grower and exporter of soybeans. April 3 (Bloomberg) -- The yen declined beyond 135 against the euro for the first time since October on bets the worst of the global financial crisis may soon be over, reducing demand for Japan’s currency as a haven. The dollar rose against the yen today as U.S. job losses last month were close to what economists forecast. New Zealand’s dollar advanced to the highest level against the yen since November after Group of 20 leaders pledged yesterday to triple the amount the International Monetary Fund can lend to crisis- stricken nations to $750 billion. The euro advanced 0.9 percent to 135.23 yen at 4:24 p.m. in New York, from 133.98 yesterday. It reached 135.26, the highest level since Oct. 21, extending its gain as U.S. stocks rose. The dollar gained 0.8 percent to 100.28 yen from 99.52, touching 100.38, the highest level since Nov. 4. The U.S. currency traded at $1.3486 per euro, compared with $1.3461. The yen dropped against all of the other major currencies this week, falling 3.8 percent versus the euro, the biggest decline since October. The dollar posted a 2.5 percent gain versus the yen, the largest advance since February. The dollar fell 1.5 percent against the euro for the week. New Zealand’s dollar rose as much as 2.7 percent to 59.03 yen, the highest level since Nov. 10, on speculation Japanese investors will seek higher-yielding assets overseas. The kiwi appreciated 5 percent this week and climbed 20 percent since the end of February, which was the biggest gain among the 16 most actively traded currencies tracked by Bloomberg. Employers in the U.S. eliminated 663,000 jobs last month, following a reduction of 651,000 in February, the Labor Department reported today in Washington. The median forecast of 80 economists surveyed by Bloomberg News was for a drop of 660,000. The jobless rate increased to 8.5 percent, meeting the median forecast of economists. “You are seeing glimmers of hope and evidence that investors are considering that this is close to the bottom, if not the bottom,” said Samarjit Shankar, director of global strategy in Boston at Bank of New York Mellon, which administers more than $20 trillion. The G-20 turned yesterday to the Washington-based IMF to prevent the worst financial crisis since the Great Depression from swamping more developing nations. G-20 leaders gave approval in London for the IMF to raise $250 billion by issuing Special Drawing Rights, or SDRs, the synthetic currency the IMF uses to settle accounts among member nations. The dollar’s role as a reserve currency won’t be threatened by the expansion in the IMF’s unit of account, according to UBS AG, ING Groep NV and Citigroup Inc.
All but three of the emerging-market currencies tracked by Bloomberg gained against dollar this week as governments and companies borrowed more in international bond markets this week than at any time in the past two years. The Polish zloty led the rally, advancing 6.3 percent to 3.3124. The South African rand climbed 5.9 percent to 9.0495 versus the dollar this week, and the Mexican peso increased 5.9 percent to 13.5486 per dollar. The pound gained versus the euro today as Markit Economics said an index based on a survey of about 700 services companies in the U.K. by the Chartered Institute of Purchasing and Supply rose to a six-month high in March. Sterling increased 0.6 percent to 90.87 pence per euro. The euro rose yesterday against the dollar after the European Central Bank cut the main refinancing rate less than economists forecast and deferred a decision on what other tools it can use to rescue its ailing economy. The ECB lowered its benchmark rate by a quarter-percentage point to 1.25 percent, less than the half-point reduction forecast by 49 of 55 economists in a Bloomberg survey. “Longer-term, this is probably euro-negative as it confirms that the ECB is behind the curve,” said Jeremy Stretch, a senior currency strategist in London at Rabobank International, the biggest Dutch mortgage lender. The euro’s gain yesterday was a “knee-jerk reaction,” and the common currency may drop to $1.23 and 87 pence in six months, according to Stretch. The dollar may extend its rally against the yen after the U.S. currency rose beyond resistance at 97.88, according to RBC Capital Markets, citing trading patterns. That level represents a descending trend line on a symmetrical-triangle pattern, wrote George Davis, chief technical analyst at RBC in Toronto, in a note yesterday. The triangle is formed during a pause in a trend by two parallel lines that connect one or more peaks and troughs in a currency. Resistance is where sell orders may be clustered.